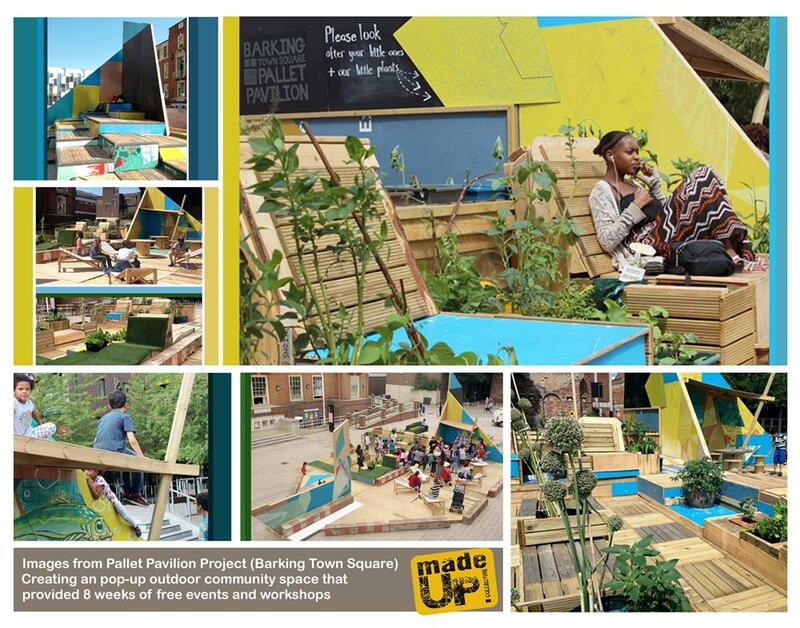 The Platform is a co-creating Pop Up, bringing new life to buildings and a courtyard at Bruce Grove Station, showcasing a cross over of food, music, art & workshops made by and for Haringey residents. 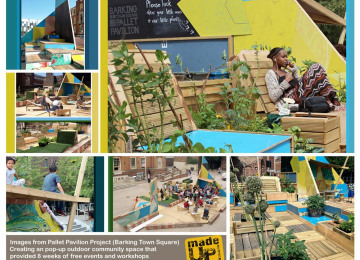 Tottenham is going through great changes... in a time of transition and huge regeneration, The Platform at Bruce Grove will be a temporary grassroots alternative space playfully merging creativity, commerce and community. 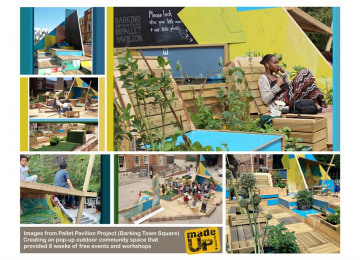 The Made Up Collective will visually transform a disused area into a public seated court yard, (similar to our Barking Sq Pallet Pavilion), and a variety of interweaving venues. The buildings will become a Pop Up Food Hub, Studio Spaces for Artists, Workshop Spaces for the Community, an Event/Gallery area to host music and art, and an exterior set aside for general seating and a weekend Made Up Market. 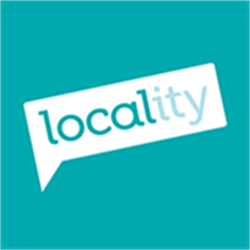 The Platform will showcase hidden businesses, community groups and creative collectives already present in Haringey through an 8 week programme of events. By creating a place on the high street to collaborate, rather than compete , where space is traded for skills, we hope to test possibilities which will feed into a proposal for longer term use as an ideas incubator. In areas where high levels of regeneration are underway, local communities seldom have an opportunity to make an impact on their environment. 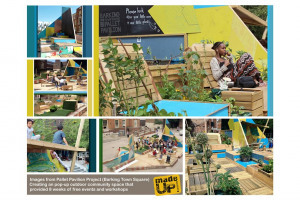 The Made Up Collective want to create a temporary Platform to test out an alternative model where different groups work in close proximity, for mutual benefit, socially and commercially. Haringey has great hidden communities, such as a large Latin American Market, and a Live/Work warehouse district full of creative professionals, from musicians, to artists/designers, set dressers, etc. These, and other assets are hidden gems that could add identity and vibrance to the high street, especially to an area in flux. 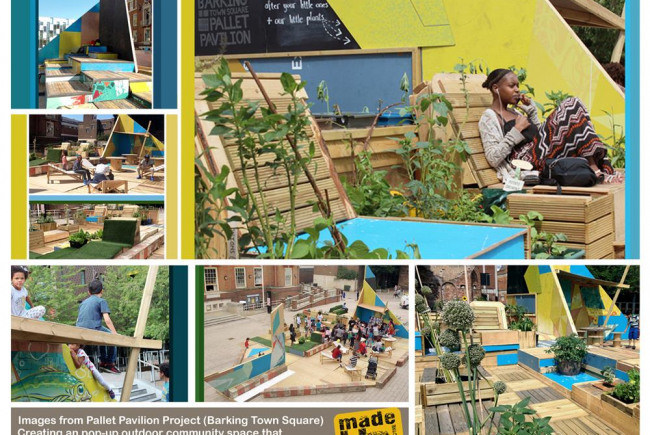 Places such as Dalston Eastern Curve Garden, Passing Clouds Venue, West Norwood Feast are inspiration. By providing a supporting test bed for people to collaborate and try out something new without the weight of paying commercial rent, we’re creating opportunities for businesses to grow in line with the regeneration of their town. The Made Up Collective believe in repurposing materials, upcycling, and generally using a 'make do and mend approach' which is even more fitting in setting up temporary structures. The Platform on Bruce Grove will grow through people making their mark, and in doing so we hope to create a concept for how the space can be used long term. We don't know the answers yet, and the Platform is set up very much as a test bed. Ultimately, at a time where regeneration is synonymous with gentrification, we'd like space to see if current communities can collaborate rather than compete on the high street and create an alternative haven in doing so. The challenge is to see whether we can take a disused space, limited time and resources, and under publicized communities and create a Platform for positive change through combining creativity, commerce and community. People’s Kitchen builds a sense of community by providing informal social spaces where people from a variety of cultures, and economic backgrounds can connect and learn from each other through cooking and sharing food. We invite strangers to come together to transform food waste into nourishing feasts, improvising dishes that just so happen to be plant based, vegetarian, culturally diverse... and, are mostly made from surplus ingredients. We believe that good food should be available for all, and, where possible, paid in accordance to what people can afford. As a society, we can address food poverty, food waste, childhood obesity and social isolation issues in holistic ways through creating community spaces with food and well being at the heart. For over 8 years we've been setting up Weekly/Fortnightly Food Waste Community Feasts based around people simply turning up and helping co-create buffet banquets from surplus. 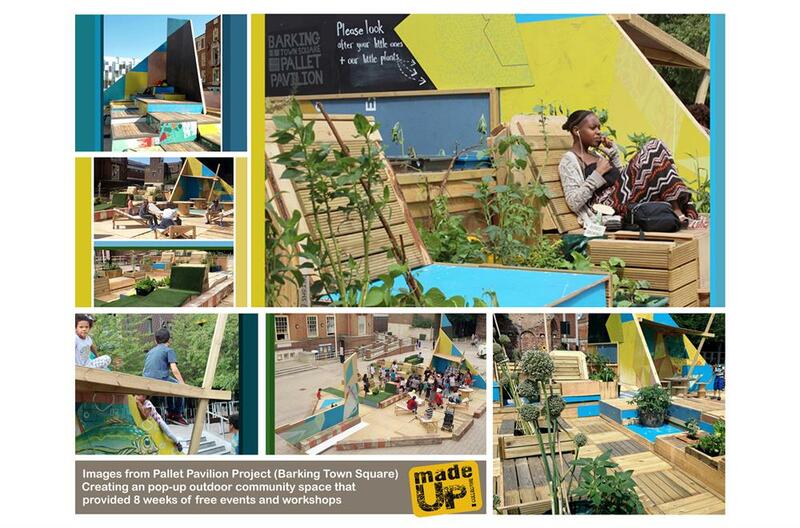 For 5 years, every Sunday we transformed the dance floor at Passing Clouds (Dalston) into a Community Kitchen. We went on to provide Family Sessions at Kingsmead Community Centre in Hackney, Workshops at the Dalston Curve Garden, Young People's Cook, Eat and Sell Sessions at Weavers Adventure Playground in Bethnal Green and also a year of Fortnightly Feasts at the same venue. For the last 6 years, Kiran Chahal has run People's Kitchen, founding the new projects, and now leading our journey to set up our First Community Cafe and Well Being Hub in Newham. It's a huge step for us, and an opportunity to not only nourish local people on a daily basis over a number of years, but to also grow our organisation into a formal Community Interest Company (CIC). We plan to focus on our permanent space, and to also start setting up Weekly/Fortnightly People's Kitchen Feasts in underused venues, nourish communities all around London. Ultimately, People's Kitchen creates opportunities for people to show care through sharing food and to help nourish themselves and others in the process. Project Delivery Manager: People's Kitchen Projects The Project Delivery Manager takes legal responsibility for receiving and spending the funds raised and ensuring the project is delivered. Contractor: Made Up Collective The team responsible for building or installing the project.